Nizole is nearly 4 years old and just started attending preschool this January. Her mother does not have a job, however she does what she can by selling sweets at local schools around the township where they live. Last week a few of our Life Child staff members were in Samora Machel and happened to stop by Nizole’s home to visit her mother. To their surprise, Nizole was home and not at the preschool. The mother told them that she thought Nizole had worms. She was very sick. Toward the end of their visit, the staff felt strongly that they needed to pray over Nizole and her mother. Afterwards, they left and went to the preschool that Nizole attends. After only ten minutes of being there, two workers from the health clinic walked in. They were there to give the children immunizations for worms! 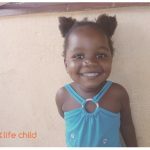 The staff immediately ran to find Nizole and they were able to bring her to the preschool in order to get the medicine she needed. Just a few days later, Nizole was back in preschool, eating, and feeling much better! This is why we do what we do. This is the Father heart of God; to save the brokenhearted, heal the sick, and bring hope to His people.